Last Saturday on the 23rd of January my partner Toni and I wanted to complete a long standing project of mine by linking up two steep couloirs in an isolated area of the mountain group Steinernes Meer ("Sea of Stone") in Berchtesgaden. 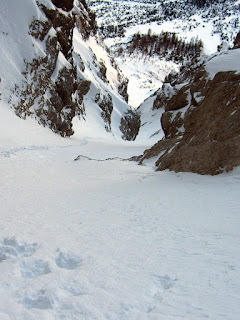 The plan was to climb up the hidden couloir in the left center of the picture below (500m, 60 degrees / AI3/III, first ascent J. Fratianni 31.03.2008). Then we would ski down the more visible central couloir (slanting from left to right, 600m, 50 degrees). To the best of my knowledge, I did the first ski descent also in March of 2008. I had attempted this link-up last March on the 18th/19th, but was turned away by too warm weather and loose snow slides. The picture above is in the first couloir at about 1850m. The slope is 40 degrees. To this point it felt like we had already done a hundred switchback turns. The first crux of the left couloir is a short ice step at AI3. As is clear in the photo above, there is very little ice. When I climbed this in March of 2008, the ice was fat but very hard and compact. On the first ascent, I left my skis and pack here and soloed the remaining climbing, rappelling over the ice pitch from a snow bollard reinforced with rocks that I broke off from the side of the wall above the ice fall. Because of the less than desirable conditions on Saturday, Toni and I changed plans and decided to ski down the first couloir from in front of the ice step and then climb and ski the central couloir. We skied down the first couloir to a protected spot behind a large boulder at about 1500m and deposited all the technical gear that we would not need for the second couloir. This is the view down the second couloir from about its midpoint. It is about 40 to 45 degrees steep and fairly wide, so therefore we could continue to skin up zig-zagging back and forth. Soon the couloir narrowed and became even steeper so that we put our skis on our backs and boot-packed up the upper couloir as it wined around to the left. The crux of the couloir is about 50 degrees. The snow became a bit firmer here so going up was somewhat easier. When skiing down through this section, the steepness really got your attention. As we got to the top, the couloir leveled where we could comfortably put our skis on and get everything set for our descent. This is the view looking down the couloir from the beginning of the descent. We had excellent conditions to ski down something so steep. The snow was packed powder that was stable. The couloir is regularly flushed out with small soft snow slides that come of the side walls or directly down the center of the couloir. The constant purging acts as a regular natural stress on the snow pack which stabilizes the snow by causing it to settle. We had previously had about a ten day period of little to no snow accumulation and consistent cold temperatures of a high pressure system. Toni and I were very cautious when evaluating the avalanche conditions in the couloirs. I was particularly concerned about buried depth hoar in the snow pack as the sun never reaches into the couloirs until around the end of March or beginning of April. Conditions are dangerous in this type of terrain when there is a lot of unsettled new snow, when the snow is wind deposited (cross loaded) from the sides, depth hoar forms and persists as the snow pack becomes thicker to the point in which the weal layer can no longer support the heavier snow above it, or when the air temperature increases together with higher humidity increasing the potential for large wet snow slides.